On Friday, 5 March 2010, Colin Dalton, senior lecturer from University of Bristol, was invited to Buckingham to give a talk on computer graphics. Being an excellent speaker and presenter, Colin completely commanded the attention of his audience for the entire period of the one-hour presentation. 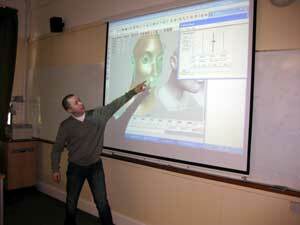 Using game animation sequences, computer generated images, interactive demonstrations and references to films such as Avatar, Stealth and The Curious Case of Benjamin Button, Colin explained the different stages of the process behind the making of modern films. He described the tricks played on the human vision system, the artistic skills, and the amount of computation and time required to bring to life the various characters in films, games and adverts. It was when Colin mentioned the computer generation of a perfect human face image as the holy grail of computer graphics that triggered the specific interest of some PhD research students from the Department of Applied Computing who have been working on face recognition and “talking faces” as biometrics-based security measures. They were left a little bit reassured, at least for the time being, that CGI is yet to seriously challenge such security systems. The talk was a great success and was well attended and enjoyed by more than 40 students and staff from across the University.